Basil is an aromatic, pungent herb that is best known for its starring role in many Italian dishes. 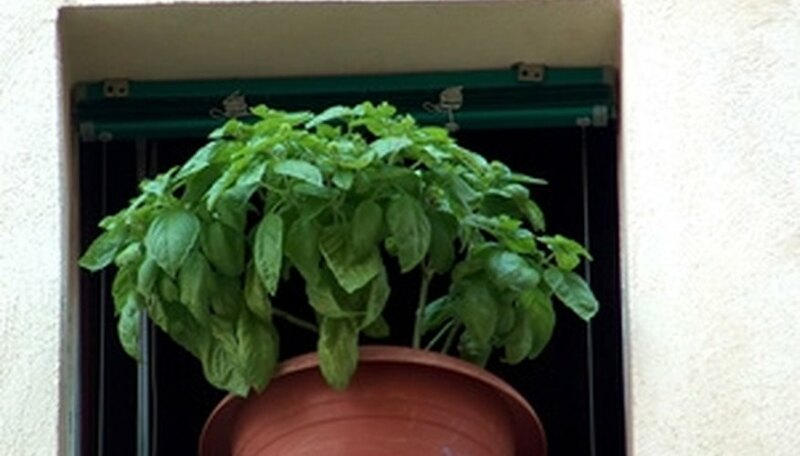 Fresh basil is easy to grow in pots of all sizes, both indoors and outdoors. The key to successfully growing basil in a pot is to start with a clean pot and fresh soil. Sow the seeds, put the pot in full sun and watch for the sprouts to appear in just seven to 14 days. Choose the right size pot for your purpose. Basil can grow successfully in any size pot, so it's adaptable to mini herb gardens on a windowsill, as well as to large pots outdoors. A pot of approximately 15 1/2 inches in diameter and 12 inches deep is a good choice for growing a large harvest of basil for both fresh use and drying. Make sure that the pot has holes on the bottom to allow for drainage. Clean the inside of the pot with water diluted with a few drops of bleach to kill any harmful bacteria. Rinse the pot thoroughly before adding potting soil. Fill the pot to about an inch from the top with fresh, high-quality potting soil for vegetables and flowers. Plant the basil seeds. Some seed companies recommend spacing the seeds anywhere from one inch to six inches apart, but basil seeds are tiny and difficult to pick up. It's easier and just as effective to gently sow a small handful of seeds---about the size of a dime---by placing them in the palm of one hand and then rubbing your hands together to distribute them evenly over the soil. Cover the seeds with 1/4 inch of soil. Gently water them to get the soil evenly moist. Place the pot outdoors in an area that gets full sun. Indoors, place the pot near a sunny south window. Keep the soil evenly moist until sprouts emerge. As the plants mature, don't let the soil dry out in the pot. You may need to water more frequently during very hot, dry weather. One or two large pots will produce more than enough basil to use fresh for adding to salads, making Italian tomato sauce, pesto and more all summer. Dry the surplus and store in plastic bags or glass jars to use throughout the year. Harvest basil plants when they reach approximately 6 inches high. Harvest often to encourage new growth so you can enjoy plenty of fresh basil all summer long and into fall. Avoid using leftover soil from pots left outdoors from the previous growing season, because it may contain larvae of garden pests or bacteria from decaying vegetation.